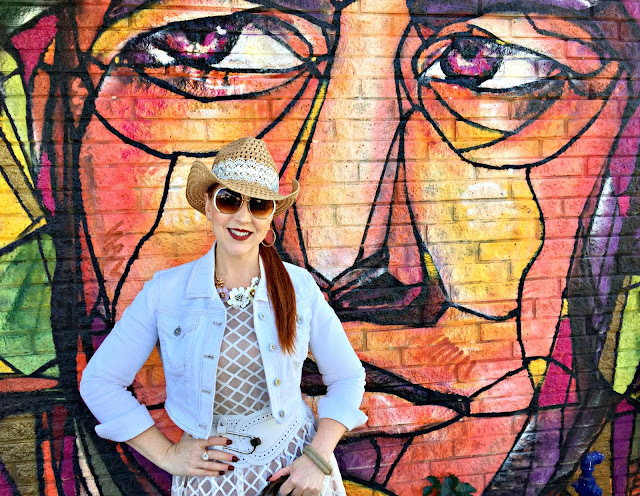 I couldn't stop looking at this street art on the side of an abandoned building, and it kept looking back at me... 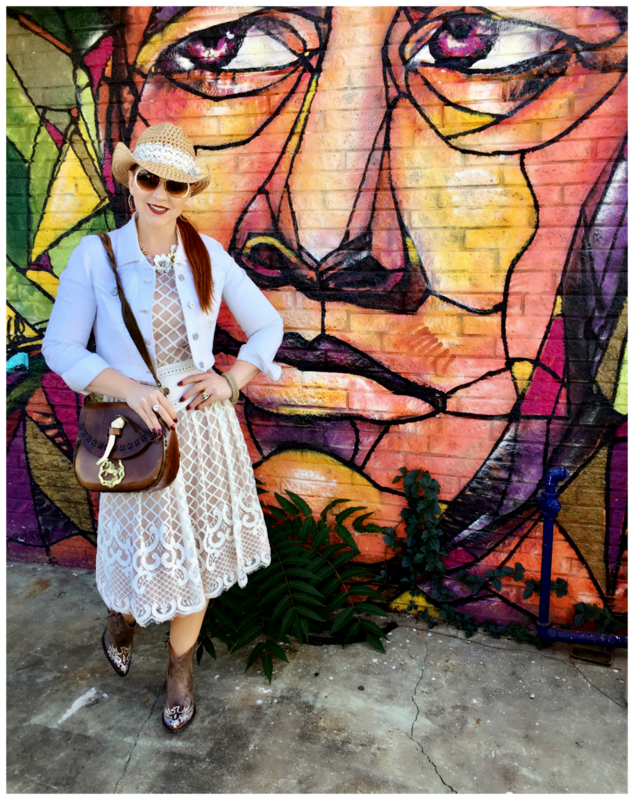 Dress (Modcloth); Hat (Melrose Ave); the bag and boots were Austin finds. Alright, alright, alright... 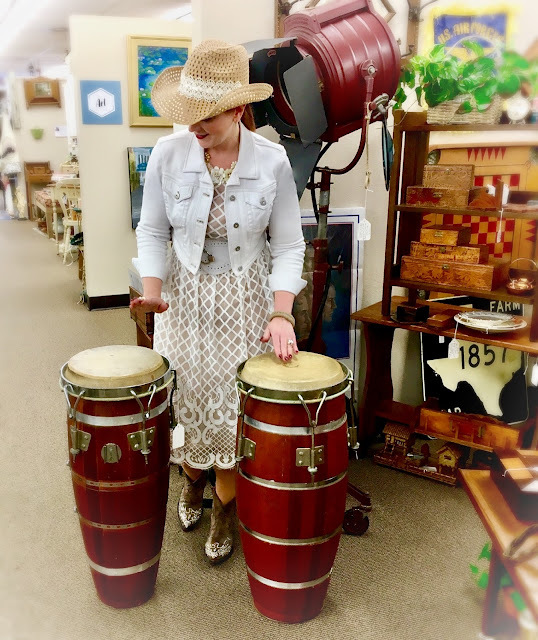 When I stumbled on a set of bongos in an Austin antique store last week, I couldn't resist channeling a certain handsome Austinite. 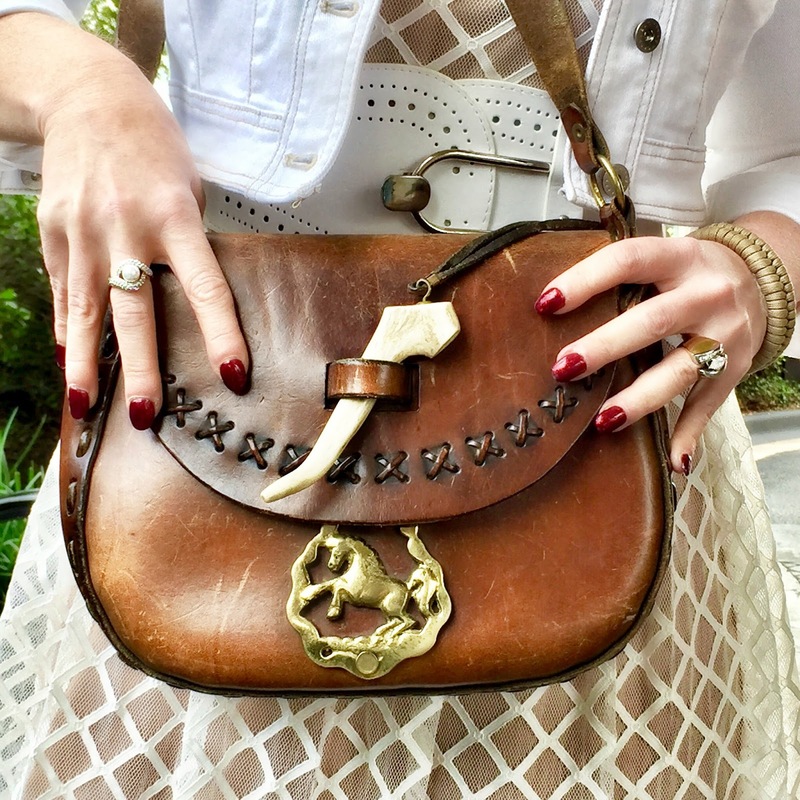 This bag is pure 1970s, made of thick saddle leather with a stag horn clasp and brass horse ornament. I found it at Charm School Vintage. 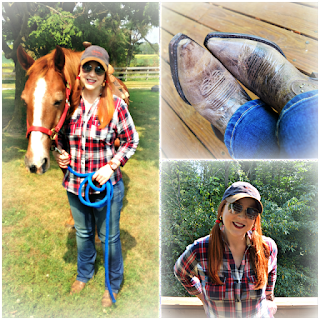 Unlike the infamous McConaughey incident, however, I kept my clothes on because, well, Red's Shoe Diaries is a fashion blog, after all (despite the similarity in name to that other, older diary about red shoes). 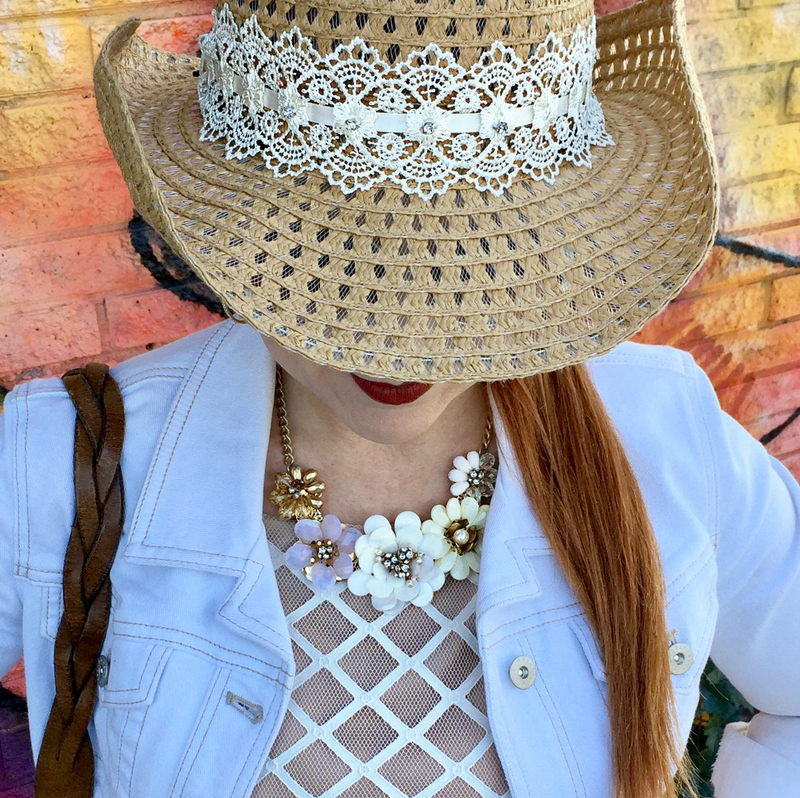 I used a crystal embellished lace headband from Wal-Mart as a hatband to coordinate with the lace dress; the necklace is from the Limited. 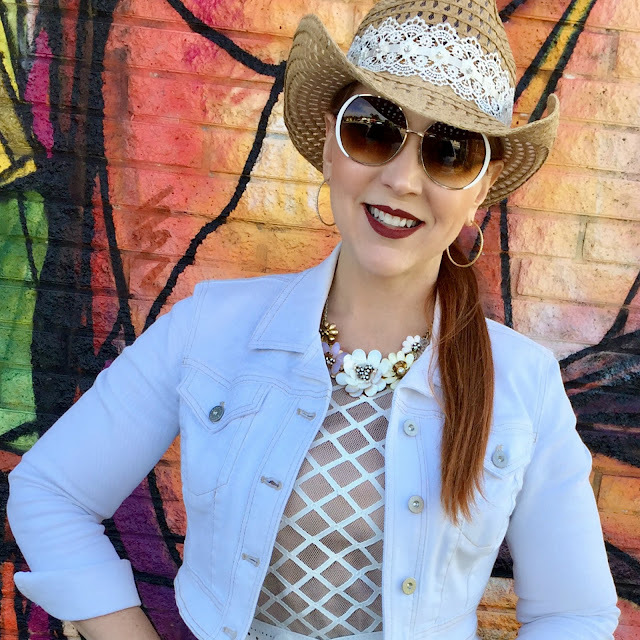 The sunglasses were from a grocery store (I've said it before, I'll shop anywhere). The whipstitched leather "brand" on the back of my vintage bag is likely a maker's mark, though it could also be the original owner's initials (or maybe both). I love it! The bongos wouldn't quite fit in my suitcase, but I did manage to find room for for a vintage, saddle leather bag and new boots. What else would one buy in Texas?! With three days to wander the city solo, and because I'd been there before, I decided to largely forego 6th Street in favor of scouting vintage stores all over the city. 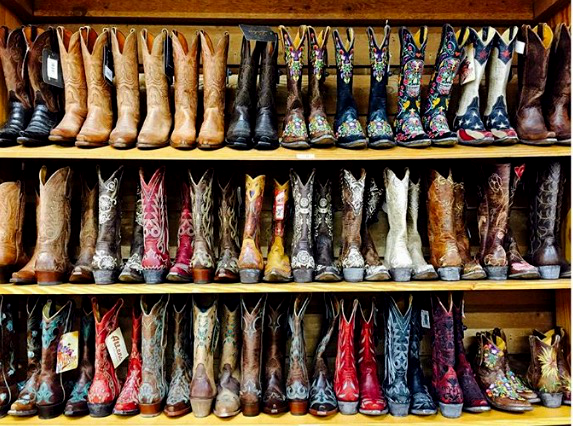 Allen's boot selection is unreal, and the smell of leather permeates the air in the most delicious way. 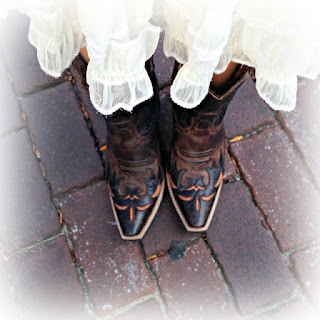 I also made a visit to Allen's Boots on South Congress, and it's a good thing my new boots from Old Gringo were made for walkin', because boy did I walk in them. 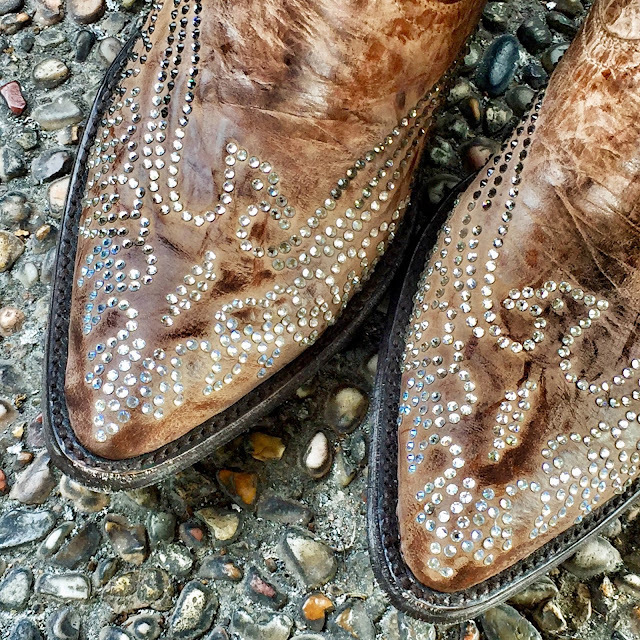 The "eagles" on my Old Gringo boots are really hundreds of hand placed swarovski crystals. No, really, when I say I walked a lot, I mean I walked A LOT, including too many times over the stinky bat bridge (which still reeks of guano despite the fact that bat season is over). Too bad I forgot my Fitbit charger...I guess that means none of my steps counted! The swarovski crystals are a stark contrast to the weathered, ulra-soft goat leather. I used this Vintage Guide to Austin as a rough map for my multi-mile scavenger hunt, which yielded the 1970's handmade leather bag, complete with stag horn "clasp," brass horse detail, and large whipstitched leather "brand" on the back, which is likely either the maker's mark or, perhaps, the original owner's initials. Bongos. In Austin... who could resist?! The bag is one of my favorite vintage scores, made from thick saddle leather that has developed a gorgeous patina with age, with visible scratches that just add character. I wish I knew its history, but I'm thrilled to give it new life. 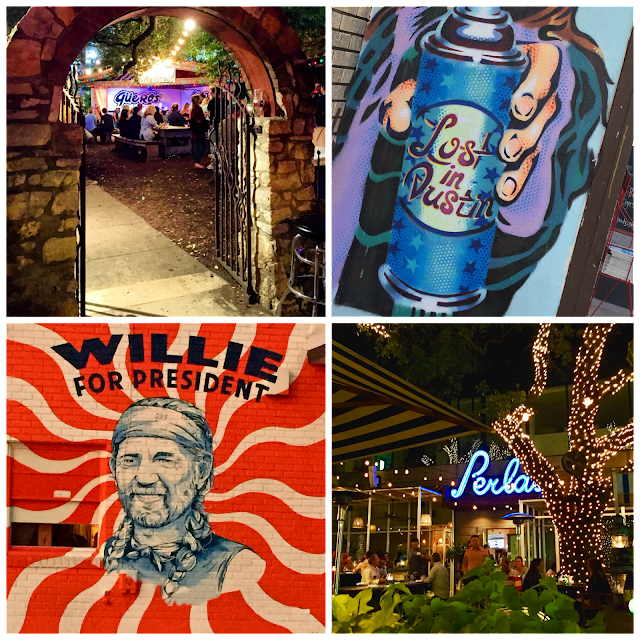 The streets of Austin are alive with artwork, fine dining and, of course, live music. 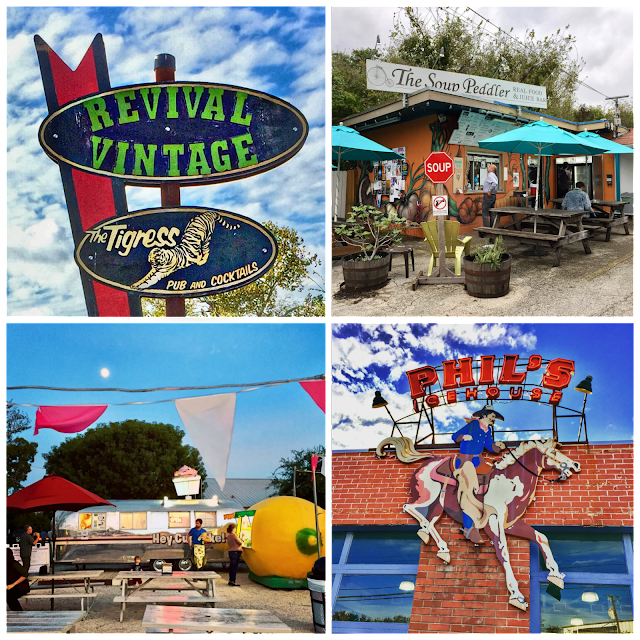 Wandering off the beaten path also resulted in discovery of a few fantastic restaurants, like The Soup Peddler (try the Mulligatawny if you ever go!) and some stellar street art. Thanks for the memories, Austin! 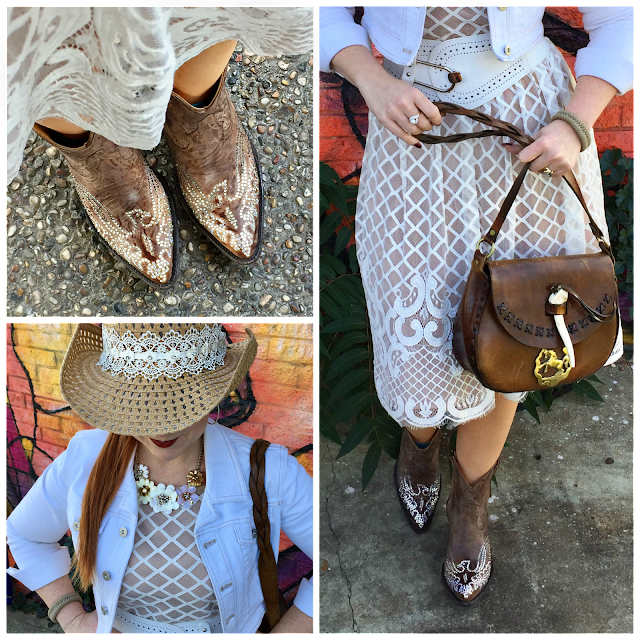 I'm linked up with Visible Monday and Shoe and Tell!